In 2013, at a point in my life when I was searching for joy, instead, what I ended up finding was gratitude. Here's what happened. I started off with a 30 day challenge ... To write about five things that brought me joy each day. Research shows that it takes 30 days to create a habit. I was studying positive psychology at the time and wanted to change the neuroplasticity in my brain. Simply put, I wanted to be happier. Initially, recognizing joy each day wasn't easy. Looking back, I knew joy was all around me, but I couldn't always "see" it. Physically writing it down each day helped me to process what I was feeling. I didn't realize it at the time, but I was literally writing myself into the next chapter of my life, one where I could see joy in everything, even in the most difficult and painful of situations. As any social psychologist will tell you, happiness is contagious. My classmates noticed what I was doing and started keeping and sharing their own joy lists. This turned into the creation of the Circle of Joy, an online forum within our class where a dedicated group of us committed to noticing joy each day. Soon thereafter, I got the idea for a Joy Jar, where each night, my husband, children & I shared five things that we found joyous that day and then chose one to write down on a scrap of paper and place in the jar. Almost immediately, I noticed an interesting phenomenon. The more I recognized joy, the more grateful I became. I had no idea that in my quest to become happier—to notice joy—what I would discover was gratitude! In 2014, my Joy Jar metamorphosed into a Gratitude Jar. For years since, I have kept a Gratitude Jar—a large, clear, decorated mason jar—on my family's kitchen table. Each New Year's Eve, my family dumps out and reads our gratitudes from the previous year, and on New Year's Day we create another jar. 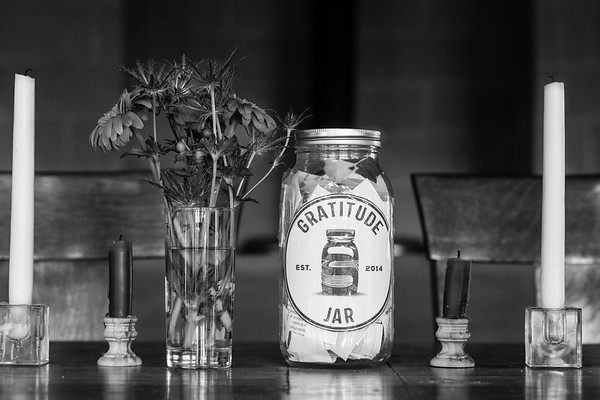 This simple practice of habitually recognizing what we're grateful for, as well as noticing the jar filling up throughout the year, has been, in and of itself, transformational. But then I had a new revelation. Realizing that people never knew how much I appreciated them—even when their name repeatedly wound up in my Gratitude Jar, even if I hadn't spoken to them in years, even when they were complete strangers—I got thinking. If the act of placing someone's name in my jar made me feel so happy, how great would that person feel if I actually let him or her know that I had done so? And then I also wondered ... How many times had I wanted to tell a friend, colleague or family member how grateful I was to them, but felt too vulnerable, too exposed? How many times did I let my ego get in the way of expressing such a compelling, human emotion? How many times had I let too much time pass without communicating my appreciation to others for their unique qualities? And why was it so easy to appreciate people from a far, but far more difficult to express my gratitude to them directly? People who know me know that I'm good at saying, "Thank you." Yet this was different. I wanted to do more. I wanted to move beyond acknowledging material and service-oriented gifts. In lieu of a quick text or pithy email. Exclusive of social media, where you won't find me. I wanted to recognize others for their exceptional person-hood, express my appreciation for the ways in which they touched my life, and honor our shared connection, whether it was a single interaction or decades of reliability. I wanted to do this in writing. With no strings attached, no pressure to "like" me back. And thus, the idea for Gratitude Jar post-cards was born. Letting others know that I placed their name in my jar, and why, I began sending one unexpected, openhearted post-card at a time. Because here's the most important thing that I've learned since first searching for joy—Our greatest legacies are our relationships. And it is my personal belief that if we commit to gratitude as our principle guide in life, we will leave indelible evolutionary marks on one another, ones predicated on unity and connectedness rather than separateness and discord. I believe there is no better time to begin this practice than now, when we're experiencing increased polarization, fear and division across the world. So if you received a post-card recently in the mail and were left wondering who I am and what I'm doing, this is the back story. This is my "why." 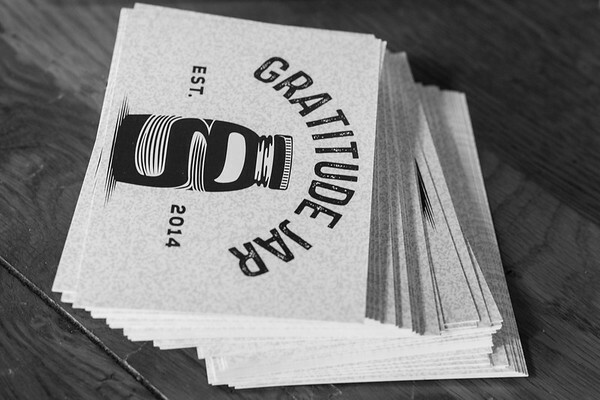 Six Gratitude Jars and hundreds of Gratitude Jar post-cards later—I not only found joy—I discovered gratitude!